I succeeded in making an adapter that will load any file supported with Assimp into Ogre. I use the latest assimp and ogre 1.10 (Ogrecave). Feel free to checkout the code on github and also offer improvement where there are enhancements or bug fixes. UPDATE:We are now using OgreAssimp as the base . Last edited by Aiden on Mon Sep 04, 2017 6:20 pm, edited 7 times in total. I've fixed the bug. Now the code is able to load models without breaking them, where it can't load it will display only a portion o the model. This is now where am at. If you think you can fix it, it will be good for the community, it's good to help ogre grow by making it easier for new users. Last edited by Aiden on Mon Sep 04, 2017 6:16 pm, edited 2 times in total. This time I can load models abit better but complex ones get abit shreded. We are going to make this into a plugin so it maybe easier for new users to add alot of models, after this we begin working with texture loading. Last edited by Aiden on Mon Sep 04, 2017 6:17 pm, edited 2 times in total. This isn't a second post. It's the main post for the new plugin (AssimpOgre-Adaptor) I intend on making. If I'll manage to make it work that is. The OgreAssimpConverter is just an external converter. I haven't found a way of integrating the code to import 3d scenes into ogre without first having to write to them to file. As a plugin it should be easy to import objects into ogre via assimp without manually converting it first. I may even use OgreAssimpConverter code if I understand how it works for this type of functionality. This should allow the plugin to be actively developed since it will have to be compatible with future versions of ogre. And as assimp grows and extends it's supported files, Assimp will also grow within Ogre as a plugin and not as an external app(converter). If you believe this feature to have been already implemented elsewhere, kindly show me how(code) or where it is(link). I may stop or delete this thread if necessary. EDIT:I've also created a cookbook for this(Assimp->Ogre Adaptor) Cookbook, if I manage to load materials and animations with this code. Then i'll make a repo on github, delete the cookbook and replace it with A plugin page. Last edited by frostbyte on Thu Aug 03, 2017 12:19 am, edited 1 time in total. When my importer fails to work I'll have to consider looking into the ogreassimp converter seriously . I'll center all my work towards making the importer work as a plugin. I've managed to improve the code a bit and it can now import simple models. I wish we had someone experienced with ogre's internal mesh format to assist us in this. I'm sure it would only take half a days work to get things working right. Then we can consider adding texture's and animation later on. Thanks for responding anyways, It's hard to get response from this site nowadays. EDIT:After skimming through the code of ogreaassimp, it seems that they have exposed meshPtr and skeletonPtr. As for MaterialPtr I see it's already attached to the mesh from the code. This means that ogreassimp may actually provide the functionality i'm looking for, I'll keep researching and update. I think i'm closing in on a solution. I think I'll use ogreassimp to create the plugin if all goes well. whats the status of the ogreKit blender importer, what .blend version is supported, whats working/whats not( pose/blendShape animation? etc... ), other problems? We where using ogrekit while ago... the blender's DNA used by Ogrekit was for an old version but it worked with newer versions (at that time, don't know about the newewewer version)... but! the project is dead so we implemented our own loader (we use the blender parser form ogrekit and copied some code from but most its written from scratch ) and we also found a way to generate newer versions of the blender DNA used by the parser. I can share the code! we are just in process of rewriting our engine and the blender loader part is very modular, not like a plugin but it shouldn't be so hard to turn it in to one. I am going to make a public repository tonight (if I managed to make some time) so everyone (but me... don't have the time yet) can contribute in making a plugin. Last edited by xrgo on Wed Aug 02, 2017 3:17 am, edited 1 time in total. xrgo wrote: I can share the code! we are just in process of rewriting our engine and the blender loader part is very modular, not like a plugin but it shouldn't be so hard to turn it in to one. I am going to make a public repository tonight (if I managed to make some time) so everyone (but me... don't have the time yet) can contribute in making a plugin. I think I was able to load a .blend file once with that code, though I didn't load skeleton and materials as my code doesn't support that yet. I'll do some testing and provide some feedback when I do. I'm already working on Ogreassimp. I still think we can do this, atleast eventually we will, it's better to fix bugs than to never actually do anything, even if the bug lies within Assimp. Yes please do, who knows maybe we could even integrate this into the plugin as some think ogreassimp can't load blend files. I just hope we get enough dev support to work on the plugin. I've tested it on a model I designed in blender, it's just a sphere with some facial features. It loads it perfectly. The file used is in .blend format. If there is a bug in loading complex models,I think we can fix it. ogreassimp does'nt expose them to the user( it always uses aiProcessPreset_TargetRealtime_Quality ) , it might be a good idea to do so since its not always desirable to mess with the mesh and if you do then at least you should know about it. any advice regarding on how to import materials with 1.10? frostbyte wrote: any advice regarding on how to import materials with 1.10? Commenting here just to thank you for that! I'm using Ver 1.9 with Visual Studio 2015 after failing to compile 1.10 sdk which also lacks learning material . Seems I'll have to ditch cmake as a build tool for OgreAssimp, and instead build it as a new Visual studio project with Ogre Ver 1.9. I've been porting my app from Opengl to Ogre3d so far it's been a success, the only thing remaining now is to enable my code to import materials, skeleton and fix the (complex mesh bug). I'm sure creating animations could've been impossible for me especially in Opengl. Keep up the good work folks, we'll get there eventually. Finally I've managed to find a solution to this problem with OgreAssimp. The solution was right beneath our eyes. Now the only thing that remains is bug fixing and materials, this shouldn't be hard to get done. I managed to work on this as my project is currently stalled, however I feel bad that now am moving to Ogre 2.1. I don't know how much things have changed there regarding manual meshes. I have not even tried moving the code there yet. If we manage to fix the materials import to work right, then I think we should just push changes to the official OgreAssimp repo. 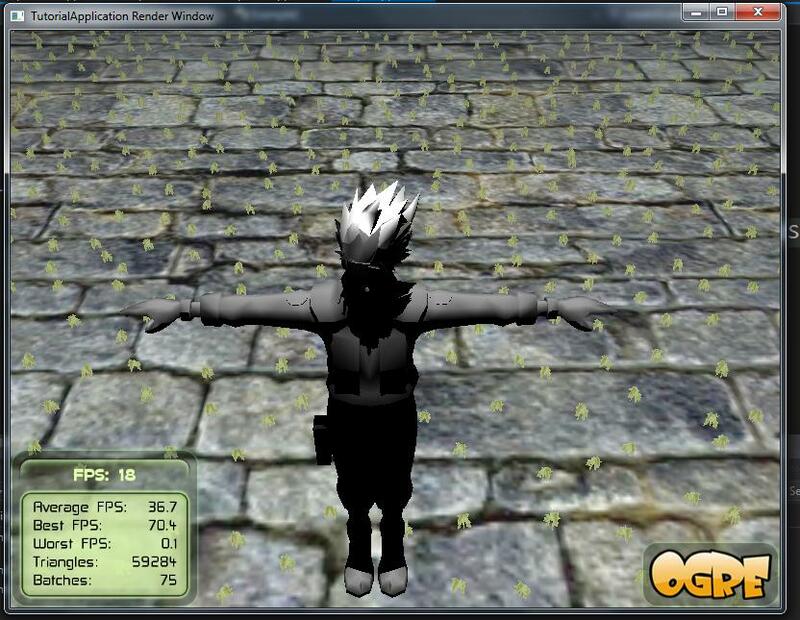 I've tested the code with various models, especially the ones that were getting trimmed and it looks good from here. This time I had to make a class for the project. You might want to use background resource loading with multi-threading as complex meshes may take a while to fully load. I also may have removed some important flags which may need to be restored prior to loading specific file types in Assimp. I think a better solution is to parse the file extension first in order to select the respective import flags. Here are some screenshots(sorry I couldn't find time to customize the scene for clearer ones). Tried adding the material above hahahaha but failed. Last edited by Aiden on Mon Sep 04, 2017 6:49 pm, edited 4 times in total.